Love dogs? Want to make a BIG difference while meeting your new best friend ever? We’re thrilled to have the opportunity to give homeless dogs a second chance at the life they deserve. Our ‘Adopted Dog of the Week’ program will spotlight great dogs waiting to find a fur-ever home on our social media sites which are named after our official mascot, Cutie, The Lion Dog. Cutie was rescued and now he is the face of many of our campaigns and outreach programs. The ‘Adopted Dog of the Week’ program is part of our ‘Fur-ever Friends: until no dog is left behind’ campaign in partnership with several reputable no-kill shelters. Please LIKE and SHARE and post comments on our social media sites (see links below) to help support this wonderful effort. Remember, TOGETHER we can save them all! Follow Cutie The Lion Dog! If you like big dogs that don’t know they’re big dogs, you are going to love Shelby. She’s a puppy in a big dog’s body. Shelby can hardly control her enthusiasm. She wants to make friends right away then have you follow her and her nose on a nice, long walk. Treeing Walker Coonhounds have a distinctive bay that lets their owners identify them from long distances. It’s a clear voice that turns into a chop when they find something in a tree and they want you to look. Shelby was transferred to Rancho Coastal Humane Society from Four Paws Coonhound Rescue through the FOCAS program. The $145 adoption fee for Shelby includes medical exam, vaccinations, spay, and microchip. For more information call 760-753-6413, visit Rancho Coastal Humane Society at 389 Requeza Street in Encinitas Ca., or log on to SDpets.org. Baby Girl is pet of the week at the Rancho Coastal Humane Society. She’s a 3 year old, 12 pound, Jack Russell Terrier / Chihuahua mix. She can be timid when she meets new people. It doesn’t take her long to let her sweet, loving personality shine through. When she arrived at one of the County Department of Animal Services shelters she had wounds to her head. They appeared to be the result of an attack. She doesn’t seem to mind and her head is healing quickly. She was transferred to Rancho Coastal Humane Society by the Department of Animal Services through the FOCAS program. Her initial shyness doesn’t last very long. As soon as she feels comfortable Baby Girl is on the lookout for a lap where she can sit down or take a nap. The $145 adoption fee for Baby Girl includes medical exam, vaccinations, spay, and microchip. For more information call 760-753-6413, visit Rancho Coastal Humane Society at 389 Requeza Street in Encinitas Ca., or log on to SDpets.org. Pinky is pet of the week at the Rancho Coastal Humane Society. She’s an 8 month old, 29 pound, Terrier / Shepherd mix. Keep in mind that an 8 month old puppy is still a puppy. Pinky has almost her whole life ahead of her. She has a lot to learn and she has a lot of love to give to her forever family. Her previous family got her when she was tiny. As she grew, they decided that she was going to be too big. So they surrendered her to Rancho Coastal Humane Society so she could find a new home. Fully grown, Pinky will be an average size dog. She has a happy personality and she seems to like everyone she meets. In the kennel, Pinky can be a little bit shy. Outside the kennel she’s a love bug. The $145 adoption fee for Pinky includes medical exam, vaccinations, spay, and microchip. For more information call 760-753-6413, visit Rancho Coastal Humane Society at 389 Requeza Street in Encinitas Ca., or log on to SDpets.org. Sophie is pet of the week at your Rancho Coastal Humane Society. She’s a 3 year old, 41 pound, Brittany Spaniel mix. Sophie is very relaxed and dignified in her kennel. She’s just waiting for her new family to find her. When she gets into her new home, Sophie will be happy to do whatever you want to do. When you’re ready to go for a walk she will be ready to go for a walk. If it’s time to relax and watch TV, Sophie will be right there with you. She’s a really great dog. Her previous family tells us that they had chickens. Sophie liked to chase the chickens. The chickens disagreed. Sophie’s family asked Rancho Coastal Humane Society to find her a new home. They recommend some place with no chickens. The $145 adoption fee for Sophie includes medical exam, vaccinations, spay, and microchip. For more information call 760-753-6413, visit Rancho Coastal Humane Society at 389 Requeza Street in Encinitas Ca., or log on to SDpets.org. Bae is pet of the week at the Rancho Coastal Humane Society. She’s a 1 year old, 10 pound, Chihuahua mix puppy. Bae was a stray when she was taken to the El Centro Humane Society. She was very afraid and didn’t want to get too close to people. While she was being transferred to Rancho Coastal Humane Society through the Friends of County Animal Services program she discovered that car rides are much better if you’re sitting on a lap. Bae is shy, but she craves attention, she wants to be touched, but when you pat her head, stroke her back, or hug her, she’s not quite sure how to react. She’s never known real love before. Her new family will need to pay lots of attention to her and encourage her until she feels safe. The $145 adoption fee for Bae includes medical exam, vaccinations, spay, and microchip. For more information call 760-753-6413, visit Rancho Coastal Humane Society at 389 Requeza Street in Encinitas Ca., or log on to SDpets.org. edit. 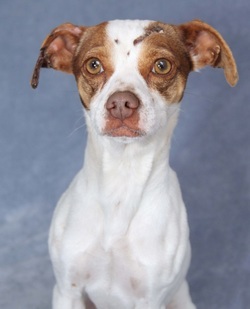 ​“Brindy” is pet of the week at the Rancho Coastal Humane Society. She’s a 4 year old, 43 pound, American Staffordshire Terrier. Brindy is an active dog with a lot of energy. After a nice walk or some play time she’s ready to settle down and get some love. At 43 pounds, she’s a medium sized dog. She gets along great with other dogs. Brindy knows the commands for “Sit” and “Paw.” She also loves playing “fetch.” When there’s nothing else going on, Brindy likes to spend hot days lounging in her kiddie pool. She really doesn’t like staying in a kennel, so she’s staying in private foster care with a Rancho Coastal Humane Society volunteer. This is a dog that really needs a new home and her own family to love. The $145 adoption fee for Brindy includes medical exam, vaccinations, spay, and microchip. For more information call 760-753-6413, visit Rancho Coastal Humane Society at 389 Requeza Street in Encinitas, or log on to SDpets.org. Kennels and Cattery open 11 a.m. to 5 p.m. every day but Tuesday. “Belle” is pet of the week at the Rancho Coastal Humane Society. She’s an 8 year old, 40 pound, Labrador Retriever / Springer Spaniel mix. Belle was surrendered to Rancho Coastal Humane Society when her previous owner became too ill to care for her. She said that Belle was indoors with her almost all the time, except when Belle told her that she needed to go outside. She never heard Belle bark. When the owner was able, she took Belle for lots of walks. She’s always ready when it’s time for a walk or even a jog. Belle gets along great with other dogs and she’s lived with a cat. Belle is an active and playful girl when she’s outside and ready to cuddle indoors. She seems to fall in love with everyone she meets. Just one more thing you should know about Belle. She’s very smart. ​The $145 adoption fee for Belle includes medical exam, vaccinations, spay, and microchip. For more information call 760-753-6413, visit Rancho Coastal Humane Society at 389 Requeza Street in Encinitas, or log on to SDpets.org. Kennels and Cattery open 11 a.m. to 5 p.m. every day but Tuesday. Huckleberry is pet of the week at the Rancho Coastal Humane Society. He’s a 1 year old, 50 pound, Whippet mix. You might even call him Huckleberry Hound….since Whippets are part of the Hound family. Huckleberry is super friendly. He loves other dogs and he’s never met a person he doesn’t like. He’s going to need an active family that will include him in all their fun and adventures. Whippets are considered to be calm, affectionate, and playful. They have short coats that don’t need much maintenance other than some brushing and an occasional bath. They can run up to 35 miles per hour. But in the living room they prefer napping on the couch. Huckleberry was transferred to Rancho Coastal Humane Society through the FOCAS program. The $145 adoption fee for Huckleberry includes medical exam, vaccinations, neuter, and microchip. For more information call 760-753-6413, visit Rancho Coastal Humane Society at 389 Requeza Street in Encinitas, Ca, or log on to SDpets.org. Kennels and Cattery open 11 a.m. to 5 p.m. every day but Tuesday. “Spike” is pet of the week at your Rancho Coastal Humane Society. He’s a 2 year old, 13 pound, Pomeranian. The $145 adoption fee for Spike includes medical exam, vaccinations, neuter and microchip. For more information call 760-753-6413, visit Rancho Coastal Humane Society at 389 Requeza Street in Encinitas, or log on to SDpets.org. A one year old puppy is grown physically, but still very much a puppy. Dune is bright, energetic, and eager to learn anything that will make you happy. He needs an active family. Dune was transferred to Rancho Coastal Humane Society from a shelter in Hawaii through the FOCAS program. “Dune” is pet of the week at your Rancho Coastal Humane Society. He’s a 1 year old, 37 pound, Australian Shepherd /Labrador Retriever mix. One year old dogs are fully grown, but they’re puppies. Puppies want to make you happy so they can get your praise and a few extra treats. Dune is very friendly and active. He has an outgoing personality and he’s always ready to make new friends, whether they’re humans or other dogs. Dune needs an active family that will include him in their lives. If you already have a dog, that’s terrific. Dune loves dogs. The $145 adoption fee for Dune includes medical exam, vaccinations, neuter, and microchip. For more information call 760-753-6413, visit Rancho Coastal Humane Society at 389 Requeza Street in Encinitas, or log on to SDpets.org. Kennels and Cattery open 11 a.m. to 5 p.m. every day but Tuesday. Peaches and the other five puppies in her litter were abandoned. They were rescued by a family that cared for them until they were old enough to be adopted. Peaches and two of her siblings were transferred to Rancho Coastal Humane Society through the Friends of County Animal Shelters (FOCAS) program. Peaches is a tiny dog. She needs a family with time to provide the guidance every puppy needs. Because she’s so small, Peaches should not live with children younger than 12 years. For now, she needs a home where she will not be alone for more than three hours. Dogs this size should never be left outdoors unsupervised. The $195 adoption fee for Peaches includes medical exam, vaccinations, spay, and microchip. For more information call 760-753-6413, visit Rancho Coastal Humane Society at 389 Requeza Street in Encinitas, or log on to SDpets.org. Kennels and Cattery open 11 a.m. to 5 p.m. every day but Tuesday. READY TO FALL IN LOVE? — Buddy is 7 months old, 42 pounds, a neutered male, Treeing Walker Coonhound/Australian Shepherd mix. He is a very affectionate puppy that likes to play. “Buddy” is the pet of the week at your Rancho Coastal Humane Society. Buddy is a puppy, but he’ll grow up to be a 60 to 80 pound adult. He and his new family will want to start training right away so they can grow together. He was transferred to Rancho Coastal Humane Society through the FOCAS program. Buddy is super friendly. He loves meeting new people and new dogs. It’s even better if he can get off his leash and play with the other dogs. He’s very active and always ready to have a good time. Take a minute to watch his video and you’ll see what we mean. Buddy was transferred to Rancho Coastal Humane Society from another shelter through the FOCAS program. The $145 adoption fee for Buddy includes his recent medical exam, up to date vaccinations, neuter, and registered microchip. Visit Rancho Coastal Humane Society at 389 Requeza Street in Encinitas or log on to SDpets.org. Call 760-753-6413 for more information. Kennels and Cattery open 11 a.m. to 5 p.m. every day but Tuesday.